Cheesecake is one of my favourite desserts but I seldom make a cheesecake because I find the amount of cream cheese in those luscious desserts a tad too much! Most of the recipes that I’ve checked out calls for 3 blocks of cream cheese, some even ask for 4! I cannot bring myself to consume so much cream cheese but I would make one for a party because then we can ‘share the fat’, ha ha! 1. Butter an 8″ springform pan. 2. Put the graham crackers in a plastic bag and roughly crush with a rolling pin. 3. Soften the butter and mix the with graham cracker crumbs. 5. In a bowl, beat the cream cheese with an electric mixer until soft, then add the rest of the ingredients, in order, mixing each one thoroughly first before adding the next. 6. Continue until the mixture thickens, then pour into the cake pan, on top of the crust. Bake in the oven for 45-50 minutes. Remove and leave to cool. 7. Once it has cooled, remove the base from the springform pan and leave the cake on a rack to cool completely. Drain one can of mandarin slices reserving 1 1/2 tablespoons of the syrup. Omit the lemon juice and use the reserved syrup instead. Fold half the mandarin slices into the batter before pouring into the pan. 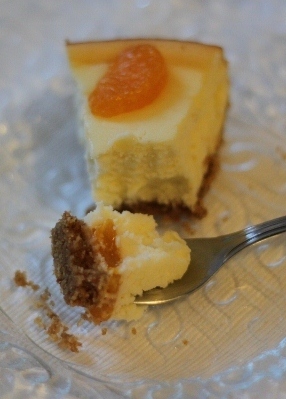 After removing the cake from the oven, lightly press the remaining mandarin slices on the top of the cake in a pattern. For the crust, I use McVitie’s Digestives biscuits or a combination of Digestives and HobNobs for extra crunch. Harumi’s recipe doesn’t require you to bake the crust but I bake it anyway for 10 minutes. Leave the base in the freezer while the oven is preheating. It’s Saturday and we didn’t have any plans to go out so I baked. My neighbor gave me 2 blocks of Philadelphia cream cheese so I decided to make something with cream cheese. 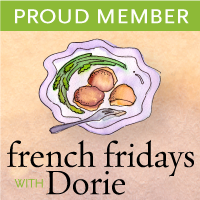 I selected Dorie Greenspan’s Espresso Cheesecake Brownies. 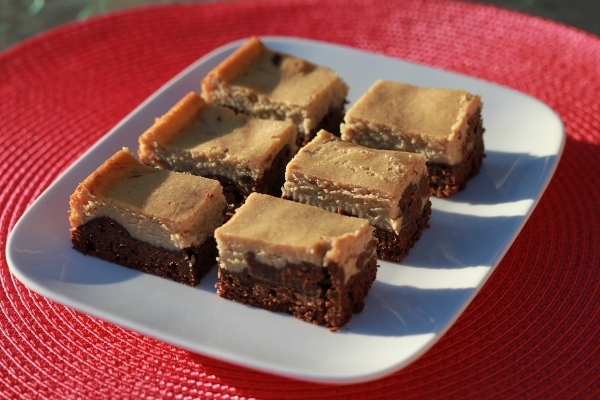 It’s brownies with an espresso-flavored cheesecake layer on top. I upped the chocolate flavor in the brownie by adding an ounce of unsweetened chocolate to the batter and replaced the sour cream in the cheesecake with whipping cream because I didn’t have any sour cream. The original recipe also called for a sour cream topping but I didn’t do that. Maybe it’s due to the changes I made but I find this dessert rather… ordinary; nice but just another cheesecake brownie. Hubby likes them a lot though! Preheat the oven to 350 degrees F. Butter, flour and line an 8″square baking pan. Whisk together flour, baking powder and salt. Set a heatproof bowl over a saucepan of simmering water. Put the butter in the bowl, top with the chopped chocolates and stir occasionally until the ingredients are just melted. Remove the bowl from the pan of water. Whisk sugar into the chocolate mixture. Add the eggs one at a time, beating well after each addition. Whisk in the vanilla and beat vigorously for a few seconds. With the whisk, gently stir in the dry ingredients, mixture only until they disappear into the batter. 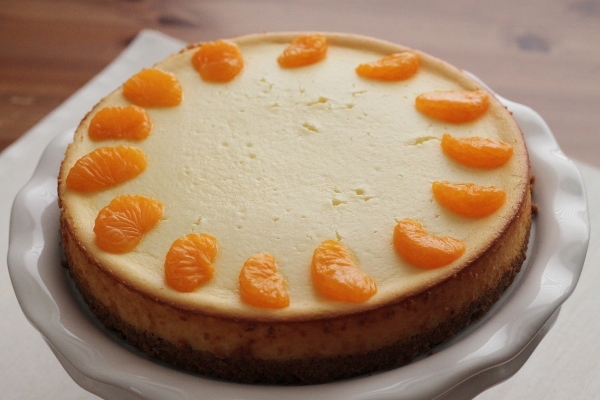 Set aside while you prepare the cheesecake. Dissolve the espresso powder in the boiling water; set aside to cool to tepid. Meanwhile, working with a stand mixer fitted with a paddle attachment, beat the cream cheese on medium speed until completely smooth. Add sugar and beat for another 3 minutes or so, until well incorporated. Beat in vanilla and the espresso mixture. Add the eggs one at a time, beating for 1 minute after each addition, then reduce the mixer speed to low and add the whipping cream, followed by the flour. The batter will be smooth. Stir the brownie batter and pour three quarters of it into the prepared pan. 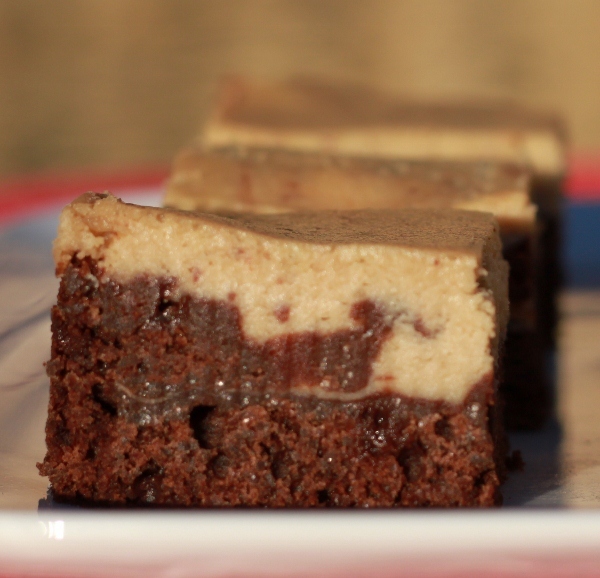 Smooth the brownie layer and pour the cheesecake batter over it. Dot the top of the batter with spoonfuls of the remaining brownie batter, then, using a table knife, swirl the dark batter into the cheesecake batter, taking care not to plunge the knife into the lower brownie layer. Swirl sparingly. Bake for about 45 minutes, or until the brownies pull away from the sides of the pan and the cheesecake layer is beige in the center, and lightly browned around the edges and puffed all over. Remove and place pan on a wire rack to cool to room temperature. When the brownies are completely cook, refrigerate for at least 2 hours, or until thoroughly chilled before cutting.